By Gordon Mackley, Performance Manager, South Eastern Division, Network SouthEast. Traditional engineering methods of measuring reliability have tended to quantify failures in accordance with technical specification rather than the effect of the failure on the customer or the business. Thus each failure of a point machine or every broken rail counted as one failure, irrespective of location or time. To overcome the limitations of such a reliability measure, the Southern Region Signalling and Telecoms Engineer devised a simple rating system far signalling failures. 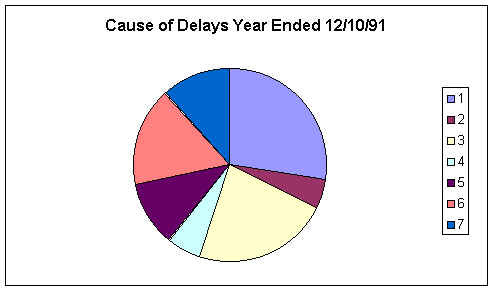 On the basis of judgement of the delays caused (as estimated from the details in the Daily Control Log) each failure was allocated "Impact Points" on a scale from one to five. In 1986 Performance Assistants ware appointed, by the R.O.M. Waterloo to improve timekeeping performance. As each person had their own view of responsibility for poor performance (usually ascribed to all other departments other than their own!) it quickly became evident that an objective numerate system for measuring the effect of all departments' failures on timekeeping was essential to carry cut this task. Any system of allocating train minutes delay to each department would have required accurate allocation of between approximately 1300 and 3000 train minutes per day on each sub-sector. Such a method was clearly impracticable. As an alternative a system of allocating “Impact points" to all incidents on the daily control log affecting passenger train running was tested. In order to check the system the total paints allocated for the day were compared to the per cent less then 100% right time for the day. This was originally described as "Failure to Achieve Right Time" but was changed to “Non-Achievement of Right Time" or "NART", for obvious reasons! With same refining of the scaring system, including extension beyond the maximum scare of five, the results were very encouraging. The system was therefore developed. As the points themselves had no intrinsic value and were an approximate judgement, they were used to produce a ratio which when multiplied by the actual NART gave a departmental allocation of the NART. Thus if operating problems scared 25 points out of a total of 100 and the right time percentage for the day was 74%, the operating NART for the day could be expressed as 6.5% (25/100x(100-74)). Because the basis of the system was the use of ratios, as longer periods of time were collated, the inaccuracies in the allocation were reduced. The original department inaccuracies were: delays caused by the effect of other trains cancelled due to no traincrew; other operating items; Signalling and Telecom; Rolling Stack; Civil Engineering and Non B.R. items. Thus each category (except possibly the last) could be managerially "owned". In order to achieve consistency, the same person, the Performance Assistant, normally does the scoring and the scares are based on his experience of the working of the timetable and the reaction that incidents cause. There is no limit to the maximum scare but most incidents score two or three paints, very large scores being exceptional. In 1988 the system was enhanced by allocating all operating items to the owning Area managers, in order to focus managerial action on reducing the large contribution of operating incidents. Because the system has now been in operation for over four years, long-term trend results are now available and considerable confidence can be placed in the accuracy of the analysis. Inevitably the system has been seen by some as another way of ‘bashing’' staff and the points awarded described as "penalty points". It is also true to say that some managers have contributed to this view. Generally however the system has been well used as a tool for prioritising management action to achieve the greatest performance benefit. Impact analysis has been used to justify investment schemes and to prevent damaging cast cutting exercises. The Impact monitoring system remains the cornerstone of incident monitoring on the Southern.